We want to help children build bridges with their voices. As we plan our eleventh Festival, we look back on the past ten. 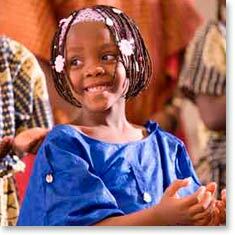 Support children of the world with our 3 year sponsorship cycles. Broaden your horizons by hosting young singers in your home. Check out videos from the 2012 and 2015 Festivals! As we plan our tenth Festival, we look back on the past nine. The members of the Piedmont East Bay Children's Choir are a vital part of the festival. They rehearse alongside visiting choirs, host performances and events, and represent the deep artistry of the Bay Area choral community. All Concert Choir singers are expected to participate fully in the festival; it will be a required component of the 2017-2018 Season. The expectations include multiple rehearsals and concerts during the week, along with festival-organized recreational activities. Ancora families are strongly encouraged to homestay visiting singers; the relationships built in these exchanges have the potential to extend into future relationships, when PEBCC singers visit other cities and countries and stay with friends made here. "The homestay program was so awesome. The girls I hosted were so fun and I think we are going to be friends for life!"